THE BEST USE OF NITROGEN IN ONTARIO SUGARBEET PRODUCTION | Chatham-Kent Agriculture Development | We Grow For the World! 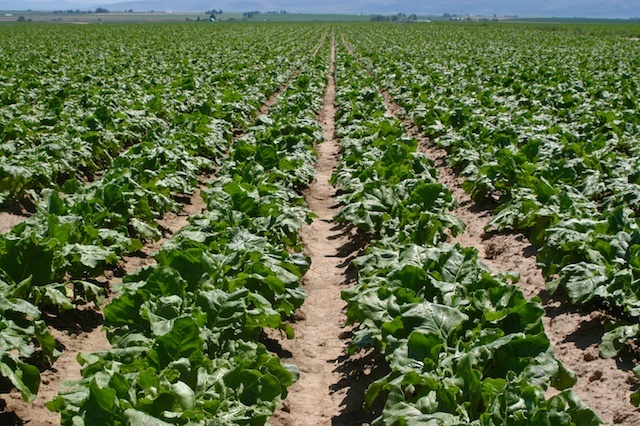 Using nitrogen is a delicate balancing act in sugarbeet production. Higher nitrogen levels mean more beets per acre but too much nitrogen lowers the sugar content. So, it’s important to ensure both the crop and the environment get the right amount of the nutrient at the right time. Sugarbeet production practices in Ontario have changed in recent years. With farmers using high-yielding, glyphosate-resistant varieties, harvest dates have moved from late October and early November to early and mid-September. And some growers have switched to narrower row-spacing and higher plant populations compared to traditional 30 inch rows. With the support of Growing Forward 2 funding, Dr. Laura Van Eerd, of the University of Guelph Ridgetown Campus, led a multi-year research project to evaluate whether these production changes have any impact on the nitrogen fertilizer requirements of the Ontario sugarbeet crop and to develop best management practices for growers. The trials at the Ridgetown Campus showed that the tested plant densities and harvest dates did not influence nitrogen fertilizer requirements or the most profitable nitrogen rate for sugarbeets, so growers can apply nitrogen at the same rate regardless of when they harvest their crop or what plant density they choose. However, later harvest showed significantly higher levels of nitrogen removed from the soil into sugarbeet roots that are removed from the field. This means growers who harvest their crop late may reduce the potential for nitrogen losses. Overall, the most profitable nitrogen application rate for sugarbeets in southwestern Ontario was found to be 136 kilograms per hectare. This was the first study to include variable revenue and variable costs into calculations of recommended nitrogen rates for sugarbeets. The best management practices developed as a result of this project were shared with the sugarbeet industry in Ontario and Michigan. The applicant for this project is the Ontario Sugarbeet Growers’ Association. The Michigan Sugar Company is a project partner, providing funding towards the project. Funding for this project was provided by Growing Forward 2 (GF2) a federal-provincial-territorial initiative. The Agricultural Adaptation Council assists with the delivery of GF2 programming in Ontario.